Hello! It's time another Sparkle Creations Rubber Stamps Challenge! Thanks to all of you who played along last week! Each week we will post an all new challenge at this time (9 PM PST on Mondays). For all the details, please visit the SCRS blog. 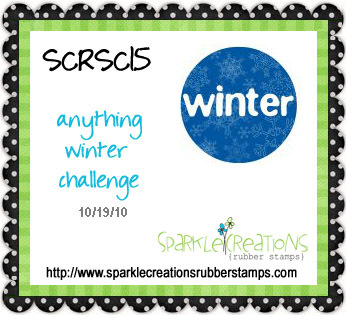 This week's challenge is to create anything winter inspired! Whether it is Christmas, snow, mugs of hot apple cider or something else, we hope that you will join us this week! In order to be eligible to win a prize, you must use a Sparkle Creations image on your project. I finally had a chance to play with Christmas Tree Ruby! Once I stamped and colored her, I decided to ditch the sketch that I had originally planned on using and let her be my entire front panel. I added some gold Stickles to the star atop the tree and shiny gold pearls along my scallop border. The entire panel is popped up with foam tape. For more inspiration, please visit the SCRS blog to see the design team's wonderful creations or their individual blogs: Kim, Laurel, Lisa, Simonne, Sparkle and Piali, our wonderful October guest designer! Accessories: Scallop Diamond border punch (EK Success), Markers (Copic), 3mm shiny gold pearls (Pizzazz Aplenty), Gold stickles (Ranger), Ribbon, Bow Easy, Foam tape, Thread, Sewing machine. So so sweet Steph! I love your stitching and the pearled scallops... perfect touches!!! Super cute card Stephanie! She looks darling! Great job coloring this cute image! OM, what a cute image, love the colors and your stitching!!! Great stitching, Stephanie! Awesome card! What and adorable Holiday card.. I love the red scallop on the top.. 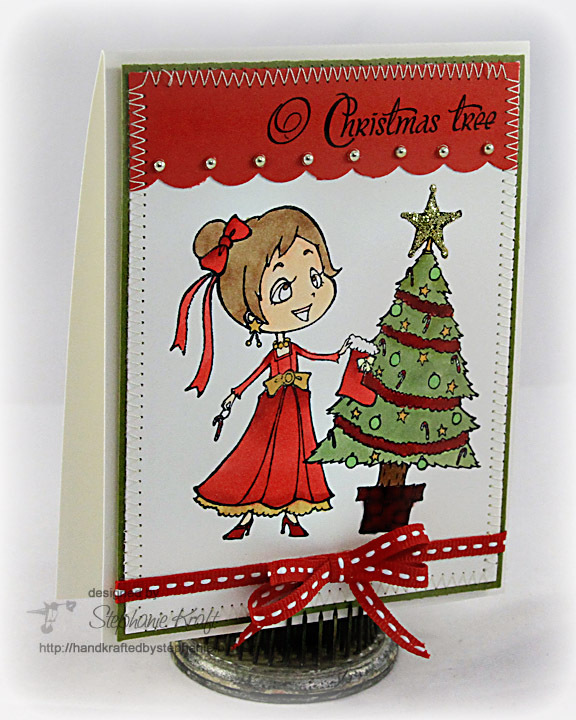 Your stitching is fabulous as always... Great card Stephanie!! This is just darling! I love the top border! Such a pretty card and image! Love the top border too! It really creates a beautiful frame for your images!